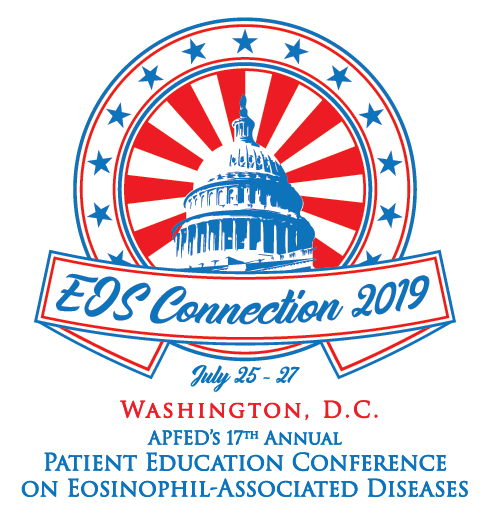 Mark your calendars for APFED’s 17th Annual Patient Education Conference on Eosinophil-Associated Diseases (EADs) on July 25-27, 2019 in the Washington, DC area (Bethesda, MD)! Join us to meet patients and families, learn more about EADs, gain practical management strategies, and hear research updates from experts in the field. Plan to join other families onsite on July 25 for additional social opportunities. Conference sessions and activities will take place at The Bethesdan Hotel, unless otherwise noted. Stay tuned for additional conference details! We have arranged for a special room rate at the hotel of $139 per night, plus applicable taxes and fees. Rooms with two beds are available – If the landing page on the link above only shows only options for rooms with a king bed, add your dates of stay and go to the next page for 2-bed options for the group rate. The discount code for rooms is auto-populated in the link. If you book through the hotel’s website instead of the direct link and are prompted for a code, use ‘AP7’. We encourage you book lodging through the link above versus booking through a third party website/service. This will help identify your reservation as part of our group. Additionally, if you book through a third party, we will not be able to assist with correcting any issues that may arise with your reservation. 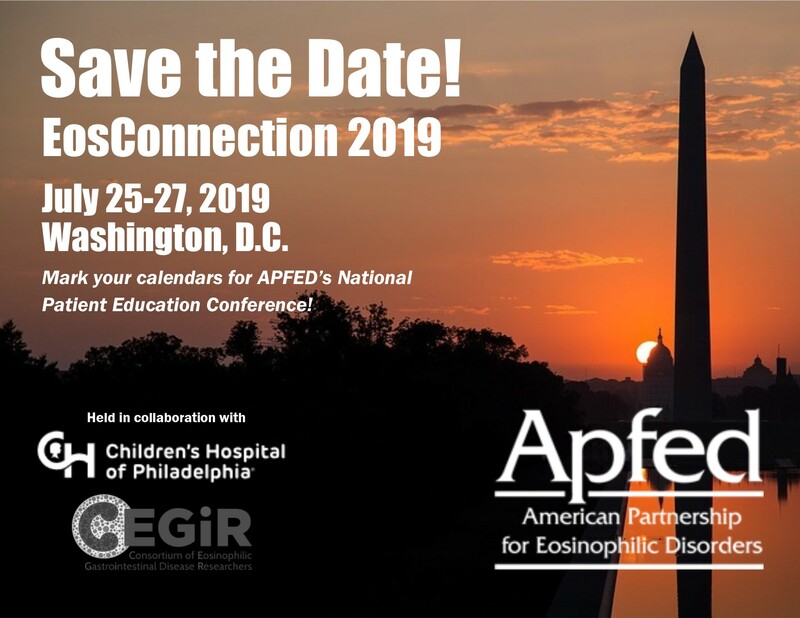 If you call the hotel directly to book your rooms, mention “APFED” or “American Partnership for Eosinophilic Disorders” for the group rate. Mini-fridges are available in each room. We will offer a hospitality suite on site which will also include a refrigerator as well as a microwave. We are working with the hotel to develop options for special allergy-friendly menu offerings through the onsite restaurant and in-room dining services; we will post more information as it becomes available. Conference Registration will open in early Spring 2019! Thinking about attending Eos Connection 2019? Join our conference Facebook group to connect with others, find out up-to-date information, and get your questions answered. 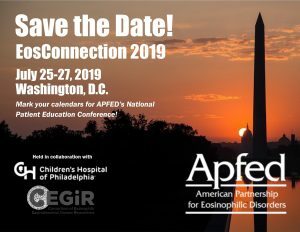 What Did Attendees Have to Say About the 2018 APFED Conference? Our 2018 conference took place in July 2018 in Denver, CO.
Post Event Q&A: Our speakers answer questions that remained from the onsite q&a panels. APFED’s 2017 Eos Connection was held July 8-9, 2017 in Greenville, SC.